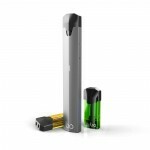 Combining all you need to begin your pod mod vaping journey, the Bo Vaping e-cig starter kit by Bo Vaping is an innovative and tech-forward design for veteran vapers and newcomers alike.The Bo pod vaping kit works with disposable liquid pods placed inside the vaporizer to allow for a satisfying experience. Lightweight and ergonomically designed, the Bo Vaping Starter Kit features a smooth ceramic coating and weighs just 22g. It takes its own branded disposable caps, which are much like regular pod mod liquid pods and each cap holds 1.5ml of e-liquid. The brand focuses on using premium ingredients to deliver flavors which are satisfying and authentic. Tree Of Life Apricot / Double Trouble replacement caps available HERE!